Comments: This is the only loon species that could be found breeding in the northern Great Plains. 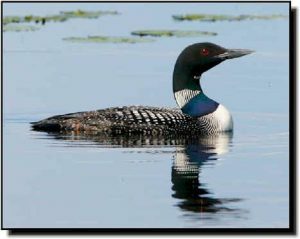 Common Loons are the most regularly occurring species in the Great Plains and often found on large lakes and reservoirs. The larger size, dark head and white-patterned neck choker distinguish them from Pacific and Red-throated loons. 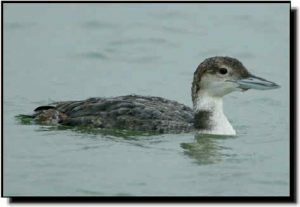 Heavy, black bills distinguish them from Yellow-billed Loons when in breeding plumage. white around the eyes and dark barring on the back.